How to grow the best Tomato crop in Tasmania. Articles How to grow the best Tomato crop in Tasmania. Tasmanians are the most passionate home growers of tomatoes in the country. Here are some tips from our horticulture courses that will give you a healthy, disease free crop this year. When to plant tomato seedlings in Tasmania. If you plant out seedlings too early, you risk them being damaged by frost and therefore putting all of their energy into repair and rebuilding rather than steady growth and flower development. What variety of tomato should I plant? There are hundreds of varieties of tomato out there and there seems to be more and more each year. The best strategy at planting time is to select at least four or five different varieties. This will ensure you get a mix of early, mid and late season cropping plants (and avoid a glut of tomatoes), a mix of different sizes and flavours of fruit and it will also provide some resistance to pests and diseases due to the different chemistry of each variety. Grosse Lisse – This means big and smooth, referring tho the fruit. They are what you imagine a typical tomato to be ie, big, red, flavoursome and ball shaped. Roma – Everyone has seen Roma tomatoes at the supermarket. They are egg shaped and are great for sauces. Tiny Tim – A good variety for pots as they don’t take up too much room. The fruit is the typical cherry tomato. Tommy Toe – A larger cherry tomato with an amazing taste. It will grow to the size of an apricot if you let it. Big Beef – As the name suggests, a large variety with lots of meaty flesh. Good for slicing in salads and sandwiches. Beef Steak – Like Big Beef, a great big fat tomato good for burgers. Heirloom tomatoes are becoming increasingly popular in Tasmania. The Friends of the Royal Tasmanian Botanical Gardens have an annual heirloom tomato sale in September. There are hundreds of varieties out there available as seed or seedlings ready to plant. Seed is available online through sites like diggers.com.au and plants are everywhere at farmers and local markets from September onwards. The advantage of heirloom varieties is their taste! Modern tomatoes have been bred to produce lots of fruit that all look the same and are resistant to disease. That’s good, but it has often come at the cost of flavour. Heirloom varieties may not look as good or crop as heavily but the taste will more than make up for that! When you are selecting your seedlings for the season, a balance of heirloom and modern varieties is a good way to go. Yellow Pear – As the name suggests, it’s yellow and shaped like a miniature pear. It’s a heavy cropper and good for salads and for cooking. Tigerella – A very heavy cropper and very flavoursome red and yellow striped fruit. Brown Berry – A cherry sized tomato with a very dark flesh. An early season fruiter and heavy cropper. Black Krim – A big dark Beef Steak style tomato with a smokey flavour and strong yield. Which tomato seedlings are best? Look for small, sturdy seedlings. These will have a good root system and will stand up to pests and diseases better than the thin tall ones you see in some nurseries. Remember, this is the crucial stage for getting a good healthy crop, so choose wisely! Should I plant tomatoes in pots or in the ground? Either is fine. The deciding factor is how much space you have for your crop. Remember they need a nice warm and sunny spot in both growing environments. You can grow substantial plants in pots and containers. With stakes to support them, plants can reach 2 to 2.5 meters depending on the variety. Tomatoes have a shallow root system and can be susceptible to roots burning in the sun, so cover them with a light layer of mulch or even a piece of black plastic. Tomatoes in pots will require more watering than those planted in the ground. If you are growing your tomatoes in the ground, wait an extra couple of weeks to put them in. That way the ground will be a bit warmer and they will get off to a good start. Dig some furrows between the rows of plants. That way you can run a drip system for watering. Spacing of plants depends on the variety, but as a rule, don’t plant them so close that the sun can’t reach each part of the plant and the air cant flow freely. This will enhance fruiting and cut down on fungal problems. How should I plant my tomato seedlings? It’s a good idea to layer your seedlings. In this instance, layering refers to laying the seedling down on it’s side in a small trench and burying all but the top few branches. This promotes lots of early root growth and will make your plants stronger, healthier and able to take up more water and nutrients. What soil conditions do tomatoes need? Tomatoes love a good rich, well drained soil with lots of organic matter. That can be added as compost a couple of weeks before the plants go in. They don’t like wet feet! Over watering or planting in a soggy spot will slow them down and encourage fungi to take hold! You can buy specific potting mix for tomatoes at any hardware store. Tomatoes need Potassium to form healthy flowers and fruit, but stressing them a bit when they are planted, by denying them a nutrient rich seedling mix encourages them to flower earlier and divert energy into producing fruit. Once the first truss of flowers has set, you can plant them out into your nicely prepared soil or give them a feed with a soluble fertiliser like “Thrive” or some sulphate of potash. Remember, not too much nitrogen! We want flowers, not leaves. Too much nitrogen will promote leaf growth over fruit. How do I water my tomatoes? Never water your tomatoes from an overhead system or hose that sprays the leaves! Only water the soil and even then, don’t splatter soil onto other plants in the row. Tomatoes are very susceptible to disease and a lot of it is spread through the watering process. Drippers and weeping hoses are a good way to go. Wetting the soil to field capacity (as much as it will take without pooling or leaking) once a week is a good start. Later in the season, you can increase to twice a week. Potted plants will need a little more as they tend to dry out quicker. Try to water in the morning so the leaves and stems are dry out quickly and fungi has the least amount of time to take hold. Tomatoes need little to no real pruning. Training the vines is important for good healthy fruit development. Use stakes or trellis to secure the main stems as they grow. Make sure there is enough airflow through the plant as you secure each point. You can “pinch out” the little shoots that develop in the axils of the bigger branches and any shoots that face in to the middle of the plant. Left to grow, these small laterals will take up valuable energy producing leaves. Pinch them out and all of that energy will go into producing fruit. What’s eating or killing my tomatoes? Everything! For all their goodness, tomatoes have to be one of the most susceptible plants in the garden for pests and diseases. Insects, bugs, fungi, bacteria and caterpillars are all lining up for a shot at your crop! These little worms burrow into the tomato to feast on the inside. They leave a tell tale small hole in the fruit. The “worm” is actually a caterpillar that will grow and turn yellow to green as it does. You can control them by applying products like Dipel, a natural caterpillar killer, to the leaves. You can also spray the plants with horticultural oils to smother the eggs of this critter! The bottom of the fruit has a dark brown leathery patch of rot when this sets in. It is caused by a lack of calcium and inadequate or infrequent watering. You can buy anti rot sprays from your nursery or make up your own calcium treatment as a foliar spray. These are sap suckers which are robbing your plants of nutrients. More than that, they are providing a pathway fro disease to enter you plants. Control them with horticultural oils like bio-oil or white oil. Pyrethrum sprays will also be effective. A systemic control for sap sucking insects is a product called Confidor which you can add to the soil. A soil borne fungus that causes the leaves of the plants to turn yellow and wilt, followed by the death of the plant. If the stem is split about 30cm from the soil level, it will show discoloured conductive tissues. This is due to disrupted water flow in the plant. Once the plant is infected, it has to be removed and destroyed. Don’t plant tomatoes in the same spot next year. Similar to Verticillum wilt, this is caused by a fungus in the soil. The symptoms are also similar. The plant begins to wilt in it’s stems which become yellow then brown then break off. Discolouration of the vascular tissue inside the stem can be seen right to the top of the plant if you cut the stems. (Verticillum wilt only discolours the inside of the stem to about 30cm high). Once infected, the plants will eventually die or become unproductive. The treatment for fusarium wilt is to remove the plant and destroy it. Also avoid planting tomatoes in the same place next year. Yellowing in between the veins of the leaves will indicate a lack of magnesium. Other nutrients may also be lacking. A general yellowing indicates nitrogen deficiency. To correct magnesium and other nutrient deficiency, add a complete liquid fertiliser like seaweed solution or “Thrive”. Small spots on the older leaves , which will increase in size, particularly when the weather is hot and humidity is high. Mostly seen in the early stage of the season after a heavy rainfall. The blight will destroy the leaves and reduce the vigour of the plants. Treat blight with fungicide. You can use a copper spray or an organic fungicide spray or dust. Late blight appears as irregular blue-gray patches on the leaves and fruit that turn brown and then black. The leaves will eventually die and break off. If untreated, the plant can die within a week of infection setting in. Remove the infected leaves as you see them and dispose of them. Wash your hands before touching the plant again. Follow the treatment regime for early blight, ie, repeat applications of Fungicides. What companion plants grow with tomatoes? Planting companion plants along with your tomatoes can increase their vigour, repel insects and control pests and diseases in the soil. Some good plants to choose include basil, borage, mint, parsley and garlic. Flowering plants like marigolds and bee balm are also good for attracting beneficial insects and repelling pests. What do the codes on tomato tags mean? Can I save my tomato seed for next year? Yes, in tomatoes that are “open pollinated” or heirloom varieties. Some of the modern hybrids produce seed that may not bee true to type. This means the second generation of plants may not have the same features as the first. If you have a favourite heirloom variety or a prolific cropper that is open pollinated, save the seeds from a few tomatoes and you are on your way. How to save tomato seed. 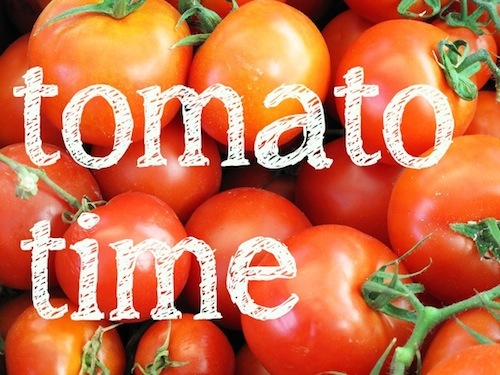 1, Scoop out the seed and pulp from a tomato and place it in a jar with a little water. Keep the lid covered with a “breathable material” like cheese cloth. 2, Place the jar in a warm spot like on top of the refrigerator. 3, Monitor the jar daily. You are looking for signs of fermentation. Stir daily and look for a change to a darker colour and a distinct odour. After a couple of days, the seeds should drop to the bottom of the jar when it’s stirred. They should now be free of any “gel capsules” that surrounded them when they were in the tomato. 4, Take out the seeds when fermentation begins. If you leave them too long, they will start to germinate. 5, Rinse off the seeds by filling the jar with water. Wait a few seconds for the bad seeds to float to the top and the good ones to sink to the bottom. Pour off the floating seeds and pulp and repeat rinsing until only the good seeds are left. 6, Dry your seeds on a layer of paper towel or tissue. Make sure you change the tissue regularly and spread the seeds out to avoid clumps forming. Dry them like this for a couple weeks. You need the seeds to be completely dry to store them. 7, Store your seeds in a foil or plastic bag that is air tight. Add a packet of silica gel in each bag to absorb any moisture out of the remaining air. Store them in a cool dark place and remember to label them! Let us know how your crop develops this summer. You can find us on facebook and share your results. If you’d like to know more about our horticulture short courses, community courses and certificate courses, check out the rest of this site and give us a call. Good Luck!